I think the one is in calligraphed style, not meant as a numeral for printing. Start holding the nib on the side for the slanted line, then go down with some force on the pen holder to open the nib at the split, end by lifting the pen gradually from the paper while making a slight leftward movement. Prof. Oswald Wenkebach, who designed this coin, was known for his natural, figurative style. The numeral fits that style. Handwriting-style lettering does not often occur on coins. Here is a British 1938 sixpence of King George VI. Look at the three characters between the date. GR is clear enough: it stands for Georgius Rex. But what is the third character supposed to represent? It has never made any sense to me. So they stuck a stroke through it, and gave it a hook at the bottom, just to make it look like a "J" and confuse me. Note also the initials "K G". As a child I thought they stood for "King George", but they are in fact the initials of the designer George Kruger-Gray. When I first saw one of those, I thought the monogram was "SRJ". And for some reason, neither Google nor Wikipedia were around to help me ... On the later (royal but not imperial) 6d pieces, with the G and the R and the small VI in the middle, it was much more obvious. Unofficial coins have more scope to be innovative or unorthodox in their approach. Here is a 2 pesetas coin of 1937 from Asturias y Leon, which was controlled by the Republicans at this point in the Civil War. I like the panoramic effect given to "PESETAS" in the legend, but it is somewhat spoilt by the fact that the surrounding numerals are not shown from the same perspective. 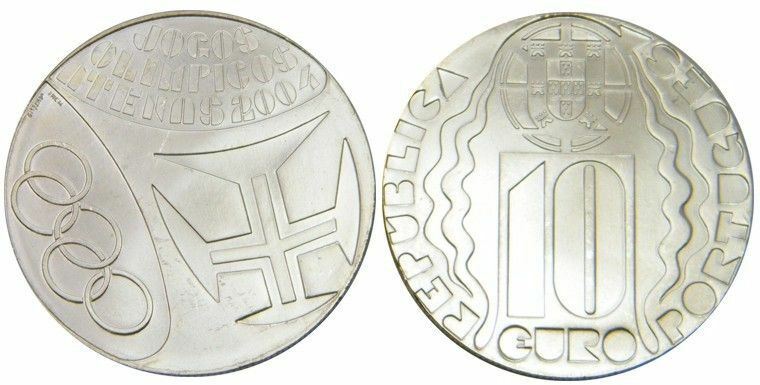 Another portuguese coin with Cubist style type. I have that same feeling in Portugal. Since it got rid of its dictatorship, it is experimenting with forms, politics, colours, communication, architecture, mores, anything that was sacred under the dictators. The experiments are making Portugal a smiling, vibrant, colourful country again. The coins reflect it. Like elsewhere, not all the experiments are a success, but their very existence is wonderful. Here is a 1 koruna coin from the Nazi protectorate of Bohemia and Moravia. The name of the state is in boring upper-case. The 50 haleru coin shows the name of the state in an attractive lower-case font. An unusual "25" on the Czechoslovak 25 haleru of the 1920s and 1930s. Not entirely successful, I think, and no other denominations were given the same treatment.